I’ve heard the weather in the UK is less sunny but I’m still hoping there’s a few extra days of sunshine once I get back to London and since some of you may still have some sunny holiday planned I thought I would share my holiday glow secret with you. So, I love a tan; whether real or fake and I find that it makes a huge difference in my outfit choices too. With a bit of a tan I’m more confident and willing to show more skin and since it’s pretty hot here, showing a little skin is a must. I have been spending a few days relaxing on a sun lounger but find a little bit of gradual tan can make a huge difference and I’ve been using the Dove DermaSpa Summer Revived Shimmer for the last few days. At first I was a little nervous, I haven’t used much gradual tan since I was a teen but I am glad to report that it’s totally different, no strong smell, the tan itself is a beautiful olive shade and it applies incredible evenly even with minimal effort. It’s super hydrating as it has one of the highest levels of glycerin found on the high street which helps skin look super healthy but also minimises streaks. The Dove DermaSpa Summer Revived Shimmer combines dermatological expertise with a spa-like experience making sure it delivers intensive skincare with its Cell-Moisturisers technology. And the scent is really nice! I’ve actually walked into a room and been asked what has made me smell so good- it’s a delicious citrus, floral, fruity scent- again perfect for summer! I also love the shimmer although I was initially a little unsure, it’s actually perfect, especially in the evening or in photos. I usually bring a shimmer oil with me for photos as I find the shimmer really makes legs look healthier and more even toned but as this also has the gradual tan it’s the perfect product. I’ve been applying mine in the evening, just before I take my photos in perfect early evening sunset and I’ll be packing it on every sunny holiday from now on. Dove DermaSpa Summer Revived Shimmer comes in medium to dark and the recommended retail price is £7.69. What are you favourite products for enhancing you holiday glow? briefly in this post. Try. which meant I had to stop using it as it was just making my hair sticky. know if it’s great either. recently check out the video here. What have you finished recently? Oh yes another eyeshadow palette, what can I say, I’m obsessed. This one has is probably top 3 palette status and I will be taking it away with me this month. Its versatile with a mixture of mattes and shimmers but since they are all largely brown it means I’ll actually use them all! It’s probably not going to change your life but this has to be the best eyebrow brush I have tried. It has a perfect angled brush on one end and a spoolie on the other and no silly lash comb. I haven’t used anything else since getting this and panic any time I misplace it, reasonably affordable as far as brushes go and you do technically get two. I never thought I would find something to rival Batiste Dry Shampoo but this is a good one especially if you have darker hair as it isn’t too white. It has quite a nice clean scent and does the job without being too powdery. I had an extreme case of dry skin last month due to an irritation from a product and this really saved me from that. It hydrated it really well without stinging or causing more damage, after a few days the skin was fully moisturised and back to normal with no scabbiness. 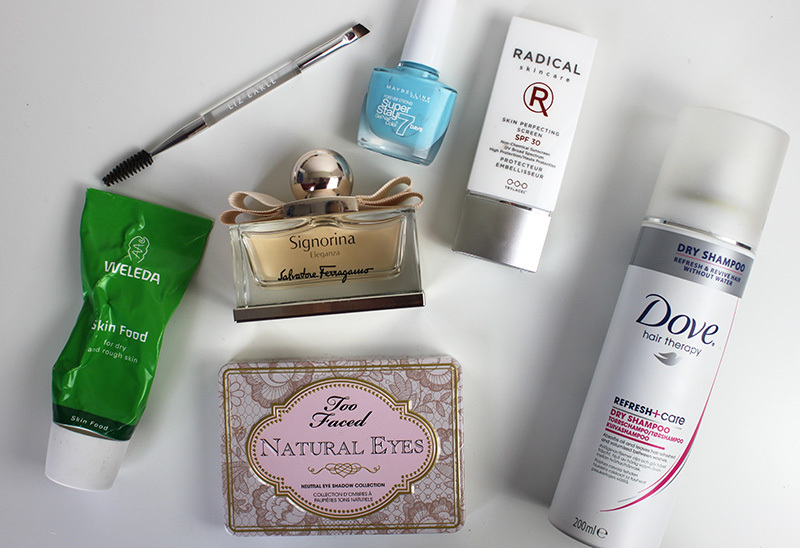 What products were your favourite last month? I’m still not sure I completely understand the point of this product but I still have been enjoying. It’s essentially a finishing misting balm which Bumble and bumble say helps create ‘lived-in, “street-styled” looks with separation and sheen’. As I have fairly oily hair I was a little nervous initially but I have been using it on days when I have apply a lot of dry shampoo and possibly overdone the hair powder or Dryspun Finish and my hair has gone fairly matte, to add some shine and life back into my hair. I personally wouldn’t use this on newly washed hair but if you have dry or coarse hair and are looking for some separation and shine this is also the product for you. 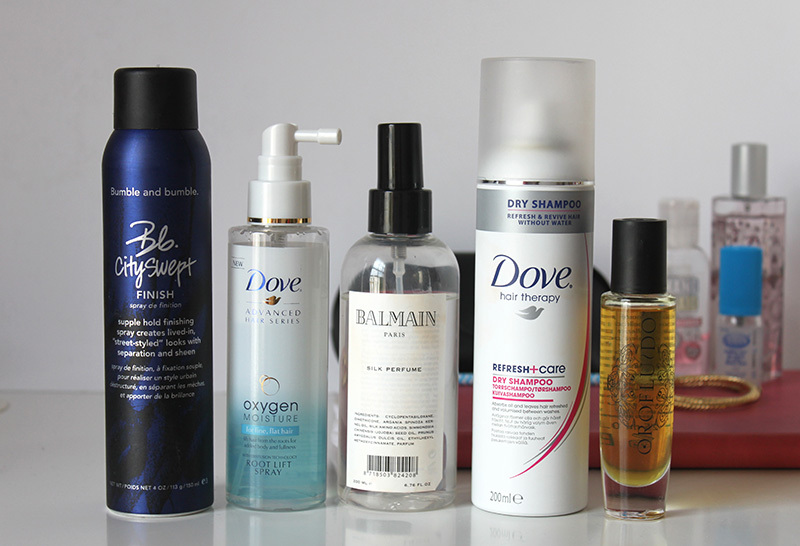 I’ve used Batiste Dry Shampoo for about 8 years now (gosh- that seems crazy!) and have tried numerous different ones all claiming to do the same thing but never being impressed so I was very skeptical trying this one. It has a very ‘Dove’ smell, quite clean and soapy but I actually quite like it and I’m close to finishing the bottle as it actually works. This is a much lighter dry shampoo and is probably best for those whose hair isn’t overly greasy but just need a bit of a freshening up. I also wouldn’t say it adds quite as much texture as Batiste but also doesn’t leave brunette hair with a grey cast. It is a little more expensive than the Batiste but I would still highly recommend trying it and I actually think I will repurchase this. I love a good volumising spray and was very excited to try this but I would just say it is average. It smells fine, leaves my hair a little crispy, adds minimal root life and I have gone through it at a shocking speed. There is another one in the Dove range which I will be trying soon and will report back at a later date. I love the bottle this comes in, it looks very luxurious and sturdy but is also a really great product. As you can tell I haven’t used very much as a little goes a long way but its great to make hair more silky, easier to brush and I’d even say it reduces drying time. You may remember I got this last month in the BeautyMart Beauty Box and at first I was a little confused by it, especially as it doesn’t even mention being a hair product on the bottle. It smells amazing which really attracted me to it and then I read that is is basically designed to detangle hair as well as condition it. It is great for people like me what love oils but are looking for something a little lighter. I use mine in wet hair but I think this masks the scent which always leads me to applying a little more to my ends once my hair is dry. 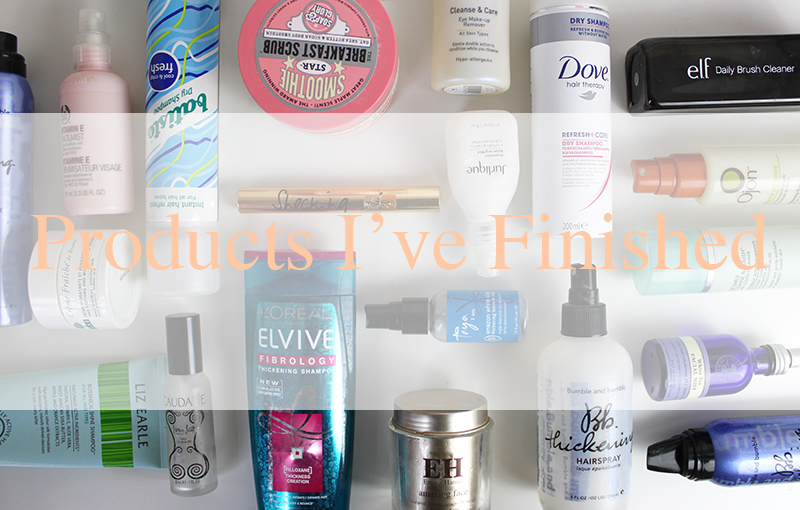 What new hair products have you been trying?